FILE - Fish are seen in a fish market near the canal of Port Said, Egypt, March 18, 2018. Drones guided by artificial intelligence to catch boats netting fish where they shouldn't were among the winners of a marine protection award on Friday and could soon be deployed to fight illegal fishing, organizers said. The aircraft can cover a range of up to 700 km (435 miles) and use artificial intelligence (AI) technology to drive them in search of fishing vessels, said ATLAN Space's founder, Badr Idrissi. "Once (the drone) detects something, it goes there and identifies what it's seeing," Idrissi told the Thomson Reuters Foundation by phone. 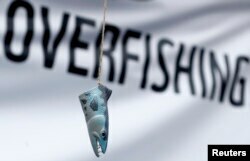 FILE - The head of a model fish is seen hanging in front a banner during a protest against overfishing outside the European Union Council in Brussels, May 13, 2013. AI allows the drones to check a boat's identification number, establish whether it is fishing inside a protected area or without permit, verify whether it is known to authorities and count people on board, Idrissi said. "The innovations from the three winning teams have the potential to greatly increase sustainable fishing in coastal systems," National Geographic Society's chief scientist Jonathan Baillie said in a statement. 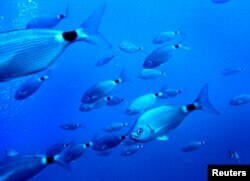 FILE - Fish swim in the Mediterranean sea on the south coast of the Balearic island of Mallorca, Spain. Much of the world's fish stocks are overfished or fully exploited, according the U.N. food agency, and fish consumption rose above 20 kilograms per person in 2016 for the first time.